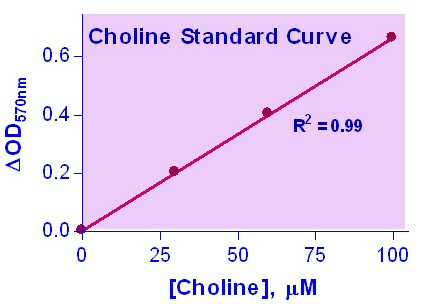 For quantitative determination of choline and evaluation of drug effects on choline metabolism. • Use 20 μL samples. Linear detection range: colorimetric assay 1 to 100 μM, fluorimetric assay 0.2 to 10 μM choline. CHOLINE and its metabolites play important roles in membrane structure integrity, cellular signaling and cholinergic neurotransmission. Aberrant regulation in choline metabolism has been associated with mental illness such as anxiety. BioAssay Systems’ method provides a simple, direct and high-throughput assay for measuring choline in biological samples. In this assay, free choline is oxidized by choline oxidase to βine and H2O2 which reacts with a specific dye to form a pink colored product. The color intensity at 570nm or fluorescence intensity (530/585 nm) is directly proportional to the choline concentration in the sample. Applications For quantitative determination of choline and evaluation of drug effects on choline metabolism. References Assay: Plasma in Fish. 2. Strilakou, AA et al (2014). Carnitine modulates crucial myocardial adenosine triphosphatases and acetylcholinesterase enzyme activities in choline-deprived rats. Canadian Journal of Physiology and Pharmacology 92(1): 78-84. Assay: Serum in Rats (Pubmed). 3. Wei, J et al (2014). Soluble Expression and Purification of the Catalytic Domain of Human Vascular Endothelial Growth Factor Receptor 2 in Escherichia coli. Journal of Microbiology and Biotechnology 25(8): 1227-33. Assay: cells in e. coli (Pubmed). 4. Benedito-Palos, L et al (2015). Lasting effects of butyrate and low FM/FO diets on growth performance, blood haematology/biochemistry and molecular growth-related markers in gilthead sea bream (Sparus aurata). Aquaculture 454: 8-18. 1. Ballester-Lozano, GF et al (2014). Comprehensive biometric, biochemical and histopathological assessment of nutrient deficiencies in gilthead sea bream fed semi-purified diets. British Journal of Nutrition 114(5): 713-726. Assay: Plasma in Fish.